Researchers studied long-term outcomes in early-stage liver cancer patients who had undergone treatment using radiation segmentectomy (RS). RS controlled the target tumor, slowed the time to disease progression and improved survival outcomes. The treatment is performed on an outpatient basis and is minimally invasive. OAK BROOK, Ill. — A novel technique that delivers high doses of radiation to tumors while sparing the surrounding normal tissue shows promise as a curative treatment option for patients with early-stage liver cancer, according to a study published online in the journal Radiology. Curative treatment options for early-stage hepatocellular carcinoma (HCC), the most common type of liver cancer, include surgery, liver transplantation and radiofrequency ablation. However, many patients are not candidates for these therapies due to the presence of other conditions. In addition, these treatments carry significant costs and potential complications. Radiation segmentectomy (RS) is a minimally invasive option that uses the radioisotope yttrium-90 (Y90) to destroy tumors. The isotope is embedded into tiny beads that are delivered through a catheter into a blood vessel in the liver. They then travel to the site of the tumor, where they come to rest and deliver their radioactive effect while sparing much of the surrounding healthy tissue. The procedure's name derives from the fact that surgeons divide the liver into a number of segments. Using an imaging approach called cone beam CT, interventional radiologists gain a detailed view of the complex liver vasculature and can focus delivery of the Y90 to the relevant segment. 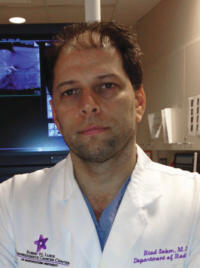 "Cone beam CT has revolutionized our ability to perform segmental injections isolated to very small tumors, sparing the majority of normal tissue," said study senior author Riad Salem, M.D., chief of vascular interventional radiology in the Department of Radiology at the Northwestern University Feinberg School of Medicine in Chicago. "Before cone beam CT, we had the ability to focus radiation, but not with this level of accuracy." Dr. Salem and colleagues studied long-term outcomes in 70 early-stage HCC patients who had undergone RS between 2003 and 2016. They analyzed the patients' responses to treatment based on two commonly used sets of criteria. Based on one criteria, 90 percent of patients showed positive response to the therapy, of which 59 percent showed complete response. Based on a second criteria, 71 percent achieved positive response, of which 16 percent achieved complete response. RS controlled the target tumor, slowed the time to disease progression and improved survival outcomes at rates comparable to radiofrequency ablation, surgery and transplantation for early-stage HCC patients. Almost three-quarters of patients had no progression of cancer in the target tumor five years after treatment. Median overall survival was 6.7 years, and one-, three-, and five-year survival probabilities were 98 percent, 66 percent and 57 percent, respectively. One-, three-, and five-year overall survival probability was 100 percent, 82 percent and 75 percent in patients with a baseline tumor size of 3 centimeters or less. "The results show that we are able to impart curative outcomes to these patients," Dr. Salem said. "Our numbers with radiation segmentectomy match or outperform those of other curative treatments in terms of tumor control, survival rate and recurrence." RS is performed on an outpatient basis, is minimally invasive and has a low toxicity profile, Dr. Salem said. Given the potency of the radiation, RS outperforms transarterial chemoembolization, another minimally invasive procedure in which cancer-killing drugs are injected into the liver's main artery under imaging guidance and travel to the tumor microvasculature. Transarterial chemoembolization has the additional disadvantage of requiring hospitalization. The researchers continue to follow the patients from the study group as they work on ways to optimize the treatment. "We want to see these outcomes validated in patients over the longer term," Dr. Salem said. "We also want to minimize the time from clinic visit to treatment, and fine-tune dosimetry so that we can find the optimal dose that will kill the tumor. In the right patient setting, RS can be considered curative."